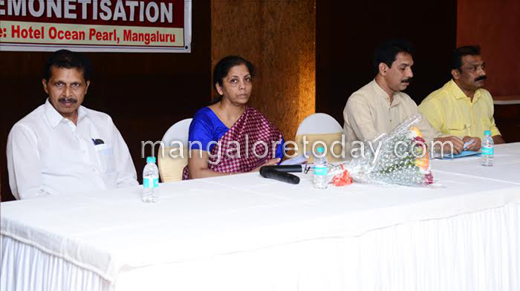 Mangaluru, Jan 12, 2017 : Praising the demonetisation move by Prime Minister Narendra Modi, Union Commerce and Industry Minister Nirmala Sitharaman said on January 12, Thursday at Ocean Pearl in Mangaluru. She said that such a decision is taken by a leadership which the BJP has provided to the country. People are supporting Prime Minister Modi’s bold move. People trust his leadership and are willing to face temporary inconvenience as they are determined to support his crackdown on black money. There is no panic. On our part, we are receiving suggestions and responding proactively to bring relief to people.The resolution went in to details explaining the objective of the government,” she said. 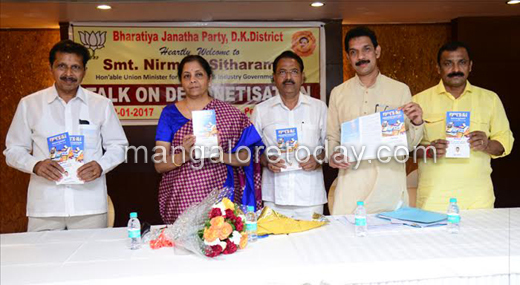 Sitharaman said the huge amounts of Rs. 500 and 1000 notes, that the banks have received, can be utilised in developmental activities. Government demonetised high value Rs 500/1000 notes to crack down on black money, leading to unending queues at banks and ATMs amid cash shortages prompting opposition parties to attack the government over poor implementation of the plan and putting people through hardships. She also said that "We have also negotiated with Switzerland and signed an agreement to share every information on Indian account there. From 2018, data will be given so that we can officially take action. ’Aakriti 2016-17’, the yearly magazine of Vikas PU College was released on the occasion. MP Nalin Kumar Kateel , Former MLA Krishna J Palemar, Chairman of Vikas Education Trust, Trust Advisor Dr Ananth Prabhu G, BJP district president Sanjeeva Mathandoor , Uday Kumar Shetty and others were present.